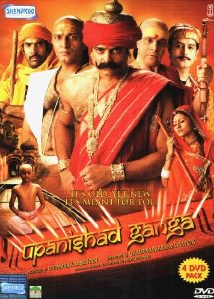 16th episode of Hindi TV Serial – Upanishad Ganga – is focused on Renunciation (in the context of the episode it is about dedicating one’s life to the greater good of the nation and society). This episode explores one of the very important aspects of the life – Renunciation, through the tale of Vidyaranya. Born and lived the large segment of his life as Madhavacharya, Vidranya was the new name he got when he decided to dedicate rest of his life for the greater good. He is known as a kingmaker and the main force behind the creation of Vijaynagar empire. From his early days Madhavacharya thought for the greater good of the society. To him, the self respect and good living of people, is very important. He thought of self esteem and nationalism with highest regards. In his life eventually he took a path where he ignited nationalism and self esteem in people and then went on tour of various areas of the nation to spread his message. In the due course he lost his wife and mother. Upon asked for getting married once again and settle down, he refused, and said that this is the best chance he got to serve the people and the country (as he have no social responsibilities left anymore). Upon being Vidyaranya he declared that his renunciation is not limited for his own self. But he sees ultimate peace in the good of the society. He rather than washing off his hands from all responsibilities took responsibilities and wrote many books for the society and waited for an opportunity to ignite the fire of freedom in the people. Those were the days when Khilji and Tughlukh rulers have ruled with cruelty and forced many people to converted to Islam. Once, two prisoners of war from Tughlukh’s capture ran away and came to him (finding him); he got the perfect opportunity. The men were Hakka and Bukka. Eventually he guided him to establish the great kingdom of Vijaynagar. The episode is nicely written and thus, despite of not having larger than the life sets, it is convincing and looks splendid. The background music is fantastic. Some special mentions include the foot noises of warhorse among others. The dialogs complement the story well. In terms of acting Amit Behl got a lot of scope in this episode and he uses it wisely and effectively. He is convincing in the title role. Some other actors played pretty effectively in smaller roles as well. Overall a balanced episode in terms of acting. The sets are effective and realistic. The research work done by the makers is clearly visible. Definitely an episode worth going for. It gives good value for the time and/or money you spent for it. If you have a good internet connection it is made available on YouTube for free. And if you wish you can definitely buy the DVD set of the TV Serial.